As a child in the faraway mountains of Norway, I stumbled upon From the Mixed-up Files of Mrs. Basil E. Frankweiler, the wonderful story of two siblings who run away from home to go live in hiding at the Metropolitan Museum of Art in NYC. I loved the idea of roaming the empty galleries alone at night, and this was the seed that spurred my ongoing series of live-in, large-size wall work creation in museums and galleries all over the world. Thus far, I have completed such solitary drawing marathons in four countries: the US; Germany; Sweden and Norway. “The relationship between concept, execution and object is particularly explicit in Kjøk’s site-specific piece for her Kunsthaus Tacheles exhibition. 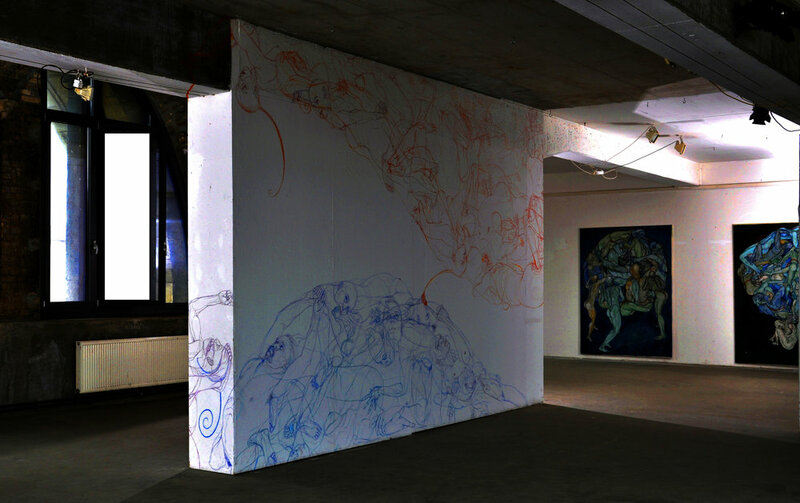 Prior to the show’s opening, she will live in the gallery for seven straight days, drawing the large-scale piece directly onto a freestanding wall, racing to complete the work in time. For much of that period, she is alone (solitude being the optimal condition for maximum concentration), eating and sleeping very little." Kunsthaus Tacheles, Berlin, in one week. On-site piece created over the course of 9 nights at Bill Hodges Gallery, New York Gallery Building at 24 West 57th Street, New York, for UN-INTERRUPTED exhibit. Created on site in 3 days at Caridi Gallery, Miami, for Art Basel Miami Beach Week.